How many times have you smiled today? How many times have your kids smiled? Your best friend? Your boss? Your co-workers? As dentists and humans, we believe in smiling. A lot. Smiles are the proof that happiness is happening right now. Yet, with our full lives, sometimes it doesn’t happen as often as we would like. We want to help you smile more. Not just you, but your family, your friends, and the people you work and play with every day. We’re asking 7500 people to take a 27-day challenge to collect 5 smiles a day (collecting a grand total of 1,012,500 smiles). We would love for you to be one of those people. Join the Million Smiles Project! This is a downloadable kit that includes essays, things to do, Smile-Collecting Cards, and a space for reflecting and collecting your smiles each day. For the next 27 days, you'll be receiving messages from us that will inspire you and keep you on track. You’ll get digital versions of all of the Smile-Collecting Cards for you to share with the people you love, especially those you cannot see in person. You'll also get other goodies to help you along your journey, including iPhone wallpapers to provide you daily smiling inspiration. Be included in the #millionsmiles challenge. 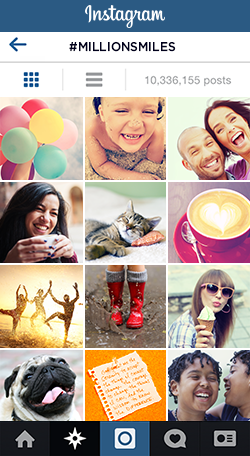 You’ll be able to share your smiles on Twitter, Facebook, and Instagram by using the #millionsmiles hashtag. You can also see what everyone else is posting there, too. A special prize at the end. 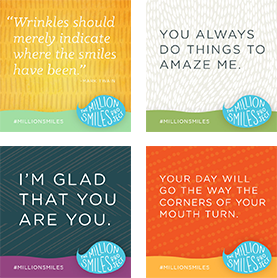 Whether you're on Facebook, Twitter, or Instagram, you can search for #millionsmiles to get regular inspiration from fellow smile-collectors (you may even find some kindred spirits!). You can also use the hashtag to share your own experiences.